Zebra original labels and ink ribbons provide maximum print quality in combination with you Zebra printer. Select from a large range of Zebra consumables for all Zebra ID Card printers from stock for immediate delivery. You only have to order as much as you need and reorder any time. Labels with extra-strong adhesives that stick to the most intractable surfaces e.g. stone, wood, metal, etc. are available as well. 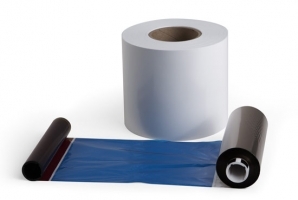 The product range also includes labels with adhesives that are resistant against chemicals and high temperatures, and removable non-residue labels. The large choice of Zebra labels allows you to use exactly the kind of labels they need for their applications. Depending on their use, the labels are made from very cost-effective or high-quality paper or plastics. This has positive effects on their application, e.g. in terms of durability. Also available in the standard range are special ribbons and foils for security and anti-forgery solutions, while individual labels with custom shapes and surfaces are available in amounts of only thirty rolls or more. All Zebra ink ribbons have been intensively tested and are recommended for use with original label materials. Together with suitable Zebra labels, these ink ribbons guarantee maximum printing quality and durability of labels and print heads. Zebra P330m Ribbon, black - Ribbon cartridge for Zebra card printer P300m, monochrome black, 1500 prints per roll. Cleaning pens - Cleaning pens for Zebra P1xx/P2xx/P330/P430/P6xx, pack of 12 pcs.